One of RSW earliest pieces and related to Tangled Branches, in terms of content but under different conditions. See also Tangled Branches to view related piece. See also Winter Mist to view related piece. "Midwinter,"... A rarely lovely mood of the leafless woods is the same scene as Tangled Branches under different conditions. 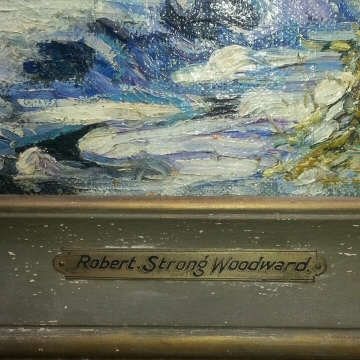 Both are most effective canvases; and both have the usual Woodward characteristic of the infinity of distance delicately intimated rather than actually painted, which is art indeed..."
One of RSW's early "woods" painting, you can see (right) the impasto technique he used at that time. 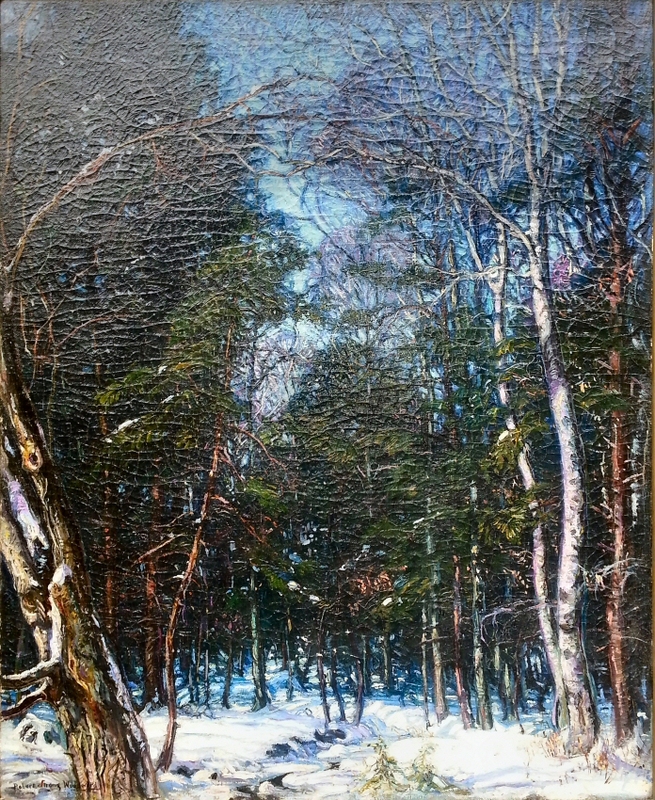 This painting exhibited in 1922 at the J. H. Miller Galleries in Springfield, Massachusetts along with Winter Mist and 4 chalk drawings. The website wishes to thank its current owner for contacting us as to the whereabouts of this long lost painting. We are immensely grateful! The signature from the lower left of painting looks like the signature he would make his trademark. This early in his career we find several versions of his signature... some with the red "S", some without... some with a year, and some without.